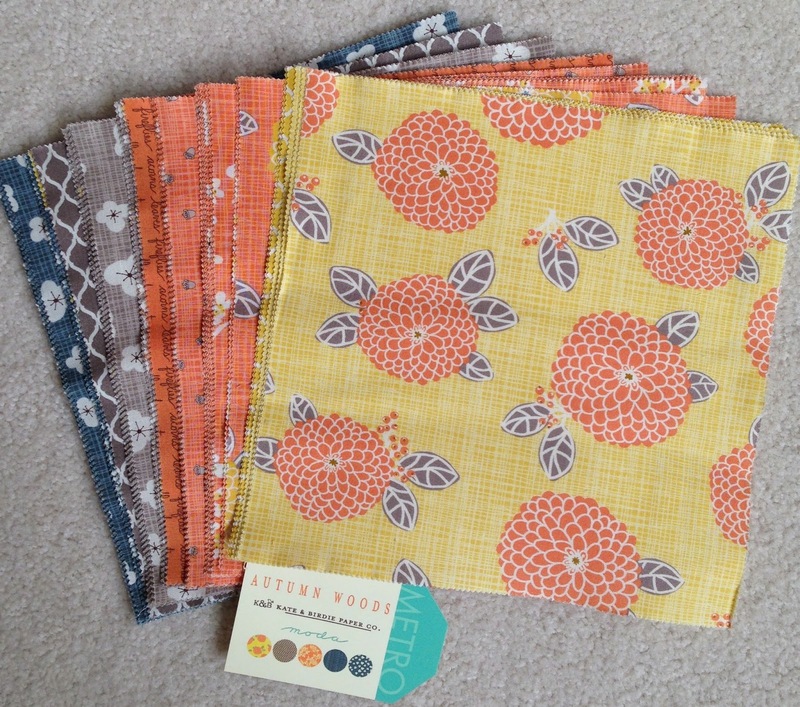 Since it's technically fall, and I like to work on fall projects in the fall, I'm thrilled I have this Kate & Birdie Paper Co fabric for Moda on my sewing table right now. but it was this border print that really sealed the deal for me. That design is around 12 inches wide. Right now my plan is to add around nine hundred 1" x 2" flying geese between the two borders in some sort of random yet planned pattern. 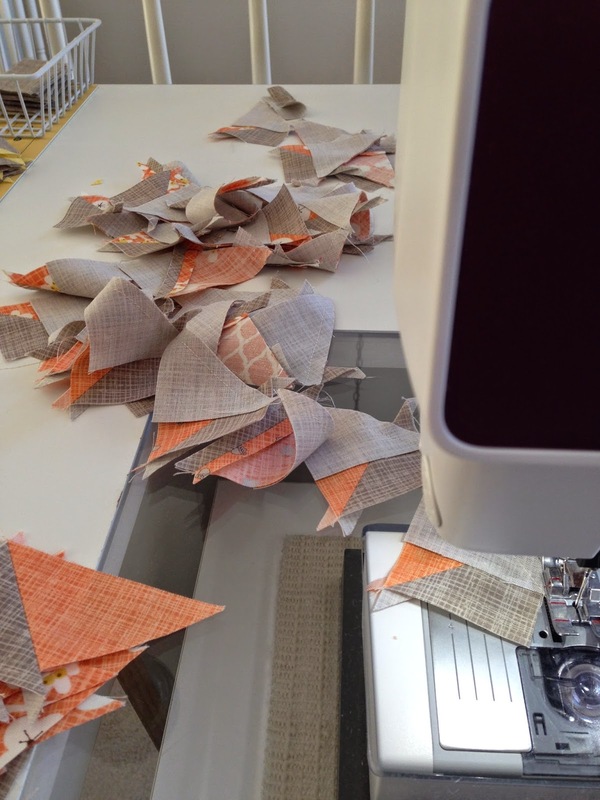 Making flying geese blocks seems to be the perfect activity for my little temporary sewing space and limited time as we work on the house. My goal is 50 geese a day. So far I've got 50 for the week! That's OK, I'll take what I can get. It's fall, my favorite time of year, and I'm sewing, it's all good. 9 HUNDY???? LOL! I had to read that like 3 times!! I love that border fabric. I cannot wait to see it all come together. I know it will be amazing! Love K&B fabric. If I hadn't been moving, I'd have poked that button. That's a lot of flying geese! Wow! I'm excited to see this one done. BTW, I don't think you or I can do "random"!!! Everything in its place with us! :-) Have a great day. oh my good goshness!!! that border print is SO totally waaaaay cool!!! I have made myself resist the urge to buy into this fabric collection so far, but it really is pretty. I have already made two quilts with some of their earlier releases - so I have to share the love. Their is a quilt-a-long going on with this fabric collection as well at Cora's Quilts. Not sure if you had seen it - but it showcases this fabric group well also. I look forward to seeing your design develop! I am anxious to see what you come up with. We all have fabrics that we fall in love with, but can't really figure out how to incorporate that design into some sort of quilt. Thanks for sharing your design ideas. I can't wait to see what you are making with it ! That border is very cool ! Is it supposed to be trees ? 900 ! WOWSER ! Can't wait to see your vision ! Awesome fabric... looks a little like linen. Are you joking about the flying geese number or does it just seem like 900?!? What a beautiful fabric range! And I am eagerly awaiting your next round of flying geese and how your vision for this project comes to life! 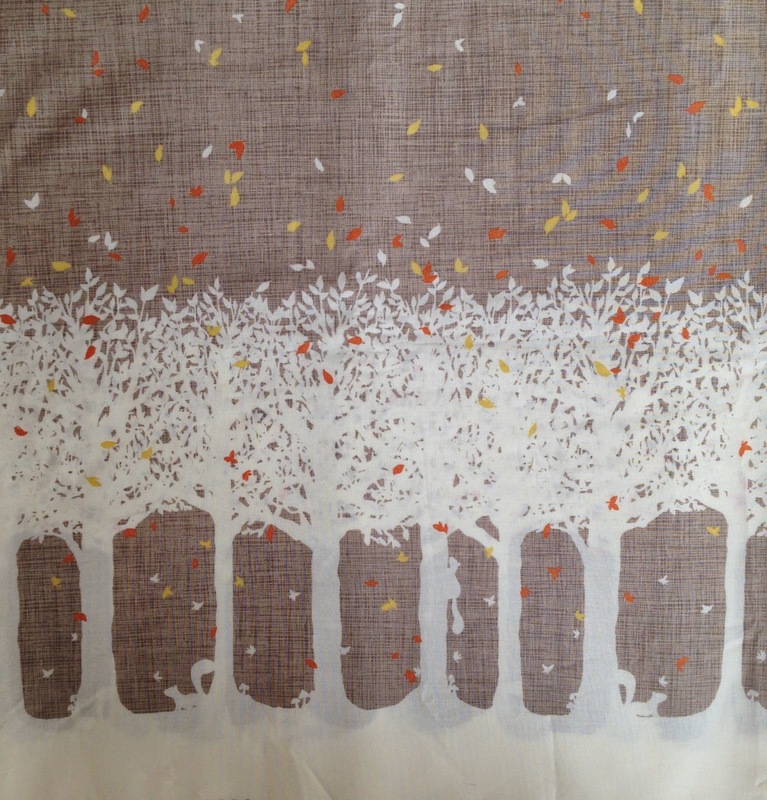 New to me fabric line, looks fab; I will have to look for it in stores. I like the border print too, and look forward to it coming together with all your geese!